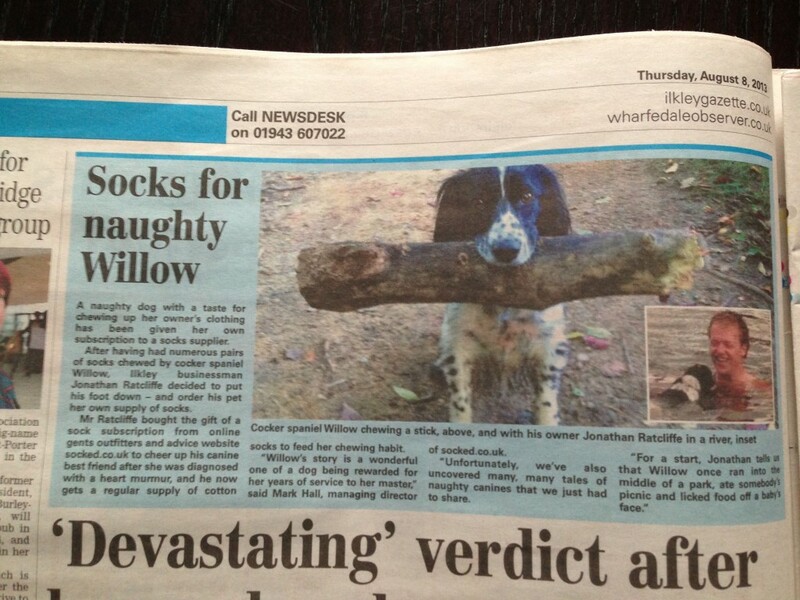 Yorkshire resident Jonathan Ratcliffe has bought a sock subscription for his beloved working cocker spaniel Willow so she can chew at that them to his heart’s content. Jonathan bought the gift of a sock subscription from online gents outfitters and advice website socked.co.uk after his best friend was diagnosed with a heart murmur, and she now gets a regular supply of cotton socks to feed his chewing habit. Jonathan is the managing director of security camera installers cctv.co.uk, and ordered the subscription to cheer up his pal, and to save his own socks. The tale inspired socked.co.uk to poll its customers and find out the worst thing that their dog had ever chewed or eaten. According to animal behaviour experts, dogs chewing things around the house is a sign that they’re bored an need a little stimulation. Most experts suggest longer walks, meeting other dogs, and interesting dog toys, of which a balled-up pair of socks seems to get the seal of approval.